Hope all of you are having an awesome time. Today I am reviewing a new scrub which I have recently purchased. 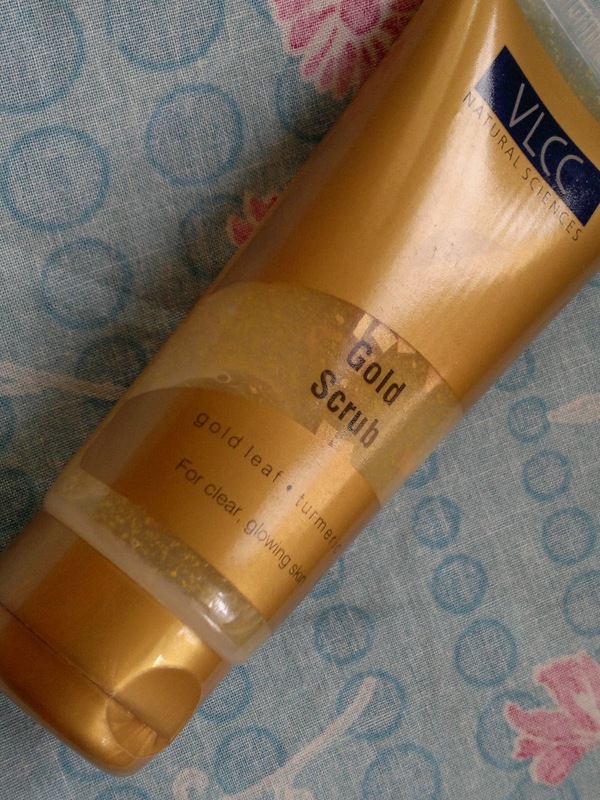 It's VLCC gold scrub, which is actually a gel based scrub with gold leaves and scrub particles. Price: INR 175 for 70 gm of product (I got this on a discounted price of INR 154). A plastic tube with flip top packaging, which is pretty sturdy for travel purposes as well. The tube is see through allowing one to judge the amount of product left. As you can see from the swtahc above the scrub is gel based with small gold particles which perform the scrubbing action as well. The first thing you notice is the awesome smell of the scrub, it is heavenly, almost transports me back to a spa. 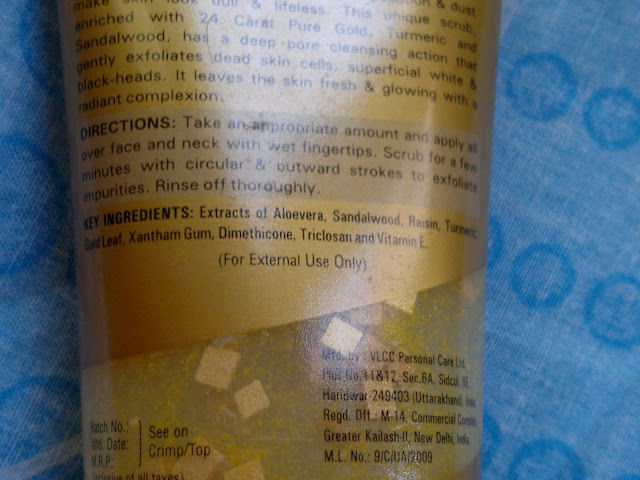 Secondly, the texture of the scrub, it is satisfactorily abrasive, yet gentle on the skin. Effectively removes black and white heads yet the gel doesn't dry the scrub and keeps the skin soft as well. As far as the effect of gold leaves and glow I couldn't find any. But the scrub made my skin cleaner and free of black and white heads, especially from my chin. Thirdly, it was equally easy to wash off as it was to apply and spread on my face. Fourthly a small quantity is enough for the entire face as it spreads well, so I guess this is going to last for a long time with me. Product rating: A, available at all VLCC outlets, drugstores, and on-line shopping websites. Would definitely recommend this to all of you for the gentle yet definitive scrubbing action on my skin. Would be good for oily to normal and dry skinned beauties. But I think people with acne prone skin should aty away from this as it might be a bit abrasive for them. i like this one..works for me..